It is a combination of exercise wheels of various sizes that have been designed to get your pet active and engaged for a long period of time. These wheels are quite durable and support easy cleaning. It has been developed using PP Plastics and it features quiet operation, safe and solid running surface with the safe tail design. This special running surface of the exercise wheel will help your hammy to exercise in controlled environment. It can be purchased from the amazon at a nominal price of only $7.99. The diameter of the wheel is about 4.9 inches and its dimension is around 5.5 x 5.5 x 3.3 inches. The chewing toy arrives with accessories like colorful blocks, wooden log, wheels and wooden balls. Its loofah textures and wood along with colorful kabobs can engage your pet in chewing and playing activities for a long period of time. Every kabob comprises of colorful chew along with wooden skewer which can be easily topped using a clasp for convenient attachment with the cage. The dimension of this toy is around 6.5 x 2.1 x 1.2 inches and price is only $6.81. Hamsters due to constant growth of their teeth are unable to resist chewing habit whether in wild environment or in cages. This chewing activity is also a source of their engagement while leading a lonely life. Keeping this trait into consideration, you can offer wooden toy pencils of PETCO for satisfying the chewing urge of your cute hamster. These toy pencils are safe for chewing and help to provide physical entertainment and mental stimulation. It is available at a price of $5.99. The price of this cave toy is only $8.99 and is also a perfect place for relaxation and fun. It mainly comprises of a rustling insewn foil that is made of superior nylon quality. This cave foil can be fixed into the cage of your hammy quite easily with the help of four straps. 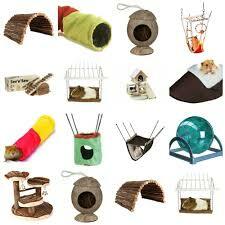 It is a small wooden sized hut which can engage your hamster either in chewing or relaxing activities at night. This small hut comprises of natural wood and it shall not affect the health of your pet. It can be fully assembled to satisfy the chewing urge. Just place it inside the cage and you will soon find how busy the hamster has got with this new stuff. The price of this wooden hut toy is $15.99 and the dimension is about 7 x 5 x 4 inches. This climbing toy ladder can keep your hammy busy for a long period of time without making any noise. If you are thinking to buy a toy then do not forget to install this ladder in the cage. This ladder offers safe climbing environment to keep it active and engaged for a long duration. It can be purchased online t a nominal price of $71.48. 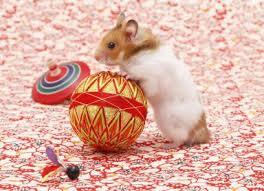 It is a yellow ball that can be a perfect playing option for your cute rodent. With this ball your it can also satisfy its urge of chewing along with rolling over on it for fun and enjoyment. The toy will definitely keep your pet fitter and busy without causing any disturbance to your sleep at night. The ball is available at a price of $22.24 from Amazon and measures 7.8 x 7.8 x 7.8 inches. No doubt, your pet hamster will not be able to resist the attraction of a hanging bed in its cage. This hammock is pretty durable, comfortable, smooth and soft. It supports easy ventilation to make your pet breath easily. It arrives with three clips that you can easily fasten in the bars of the cage. It comes with different colors and your hammy can use it for relaxation or can pounce over it to have fun. The price of this hammock bed is only $12.86. Your pet who has been confined in cage for long would definitely love to have this wonderful toy hut made of hand-woven natural grass. This will surely give it the choice to satisfy the natural urge of exploring, burrowing and nesting inside this small toy hut. The grass that has been used for woven is that of sisal tassel. It will offer perfect ventilation to your hammy and price is only $6.52 only. The size of this toy hut is about 4 x 3.5 x 7 inches. This toy is made from the wood of china fir plants and can be a great source of enjoyment for your pet hamster. It can chew the wooden wheel or ball to sharpen its teeth or pounce over it to play with the play. It shall definitely keep your hammy busy all through the day. The product is available at a nominal price of $8.99 from the amazon platform and its size is about 2.8 x 2 inches. This toy can easily lift the mood of your pet when living alone in the cage.